I’ve never been a fan of reality television. Too many of those shows seem like cheap, exploitative ways for networks to make a quick and easy buck. But CBS’s The Amazing Race is at least an interesting premise, and the idea of teams on a globe-trotting race for the prize is one I can get behind. Between scenes of sensationalized drama, viewers can at least see interesting locations and maybe learn a bit about the world around them. 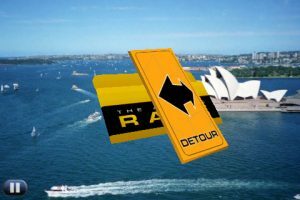 Ludia does a nice job of translating that jet-setting/beat-the-clock vibe with their iPhone take on The Amazing Race [iTunes Link]. 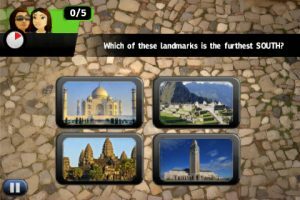 By mixing snapshots of beautiful landmarks with mini-games, resource management, and trivia, the game feels like a spin on Where in the World is Carmen Sandiego, which is a perfect fit. Players begin by selecting their avatars and heading off to the race. You can begin by choosing how many rounds you’d like to play, giving you the choice of a quick trip to a full season. (For players who don’t have time to sit through an extended session, a quick-play mode is offered, featuring challenges that are unlocked by playing through quest mode). You’re then given an allowance and transportation options. 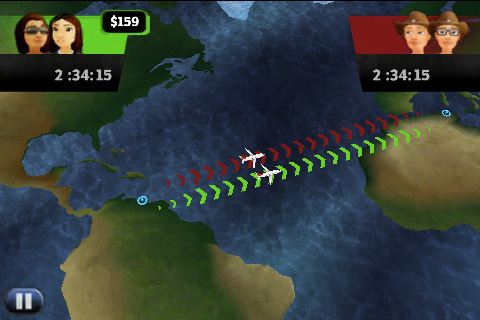 This is key, as the more expensive travel options will get you to your destination more quickly, but will also drain your account, which could come back to haunt you later in the game. In between traveling, you’ll have to complete a series of mini-games, which can range anywhere from answering basic trivia to counting cars and playing match games. It’s true that these little games are little more than simple diversions, but the better you perform, the greater your reward. Fans will be happy to know that many of aspects of the show have been translated over to the game. Voice-over is performed by show host Phil Keoghan, the introduction and logo is lifted straight out of the television show, and random events like flat tires and obstacles simulate setbacks that happen to real-life contestants. While the production doesn’t always feel top-notch, it at least provides a reasonable facsimile of what viewers would see on television. Bottom Line: The Amazing Race isn’t a very deep game by any stretch, and some of the mini-games are a bit too basic. But the game does a great job of providing fan service to those who love the television show. The Amazing Race is compatible with iPhone, iPod touch, and iPad. Requires iOS 3.1.3 or later.